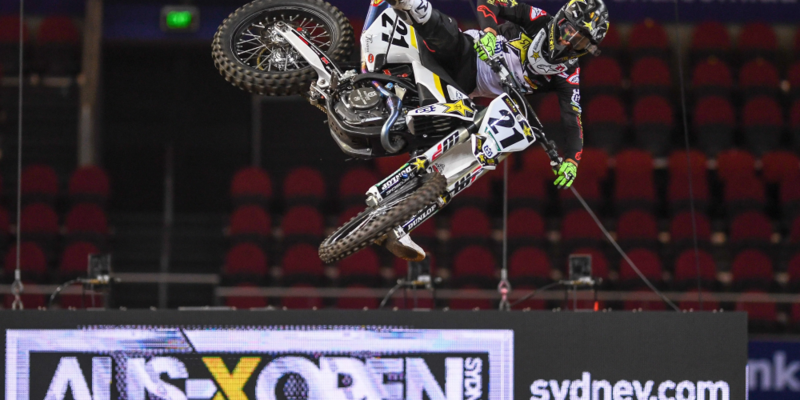 Putting in a dominant performance in Sydney, Rockstar Energy Husqvarna Factory Racing’s Jason Anderson has won the 2018 edition of the AUS-X OPEN Supercross. With the event featuring a triple crown format, the FC 450 ROCKSTAR EDITION powered rider won all three final motos inside the impressive Qudos Bank Arena. Entering the 2018 AUS-X OPEN as part of his preparation for the 2019 AMA Supercross Championship, Jason Anderson enjoyed a highly successful two days of racing in Sydney. Securing a positive fourth place result during Friday’s qualifying, Jason was determined to show more of his true potential in Saturday’s final motos. Getting a good start in the opening moto, the American took the lead in the early parts of the race and went on to secure the win. Moto two saw Anderson involved in a strong battle with fellow Husqvarna rider Dean Wilson. Pushing hard right to the finish, Anderson claimed victory to make it two wins in two motos. Getting the holeshot in the third moto, Anderson went on to wrap up the evening in Sydney with a perfect score of three wins. Collecting a total of 75 points, Jason Anderson earned the 2018 AUS-X OPEN overall victory, with Husqvarna-mounted Dean Wilson securing the runner-up spot in the event’s final standings. The Rockstar Energy Husqvarna Factory Racing team of Jason Anderson and Zach Osborne will return to action at the 2018 Supercross de Paris in France on November 17/18.